This delightful documentary revolves around two orphaned sisters Sal (Makenzie Vega) and Rae (Abigail Breslin) who rescue a Great Dane puppy from an oncoming truck, after the poor animal was dumped by two criminals. For Sal, she has spent years preying for a puppy and when this day occur, it seems like the heavens have finally answered her prayer and she victoriously names the puppy Chestnut due to his colour. As both the sisters are in a orphanage run by nuns, they believe that they will take unkindly towards their puppy and attempt to hide him in some truly hilarious ways. For Sal and Rae, there luck also changes as a loving couple named Matt (Justin Louis) and Laura (Christine Tucci) have decided to adopt them that causes Sal to hide their puppy from her newly adopted parents. To compound the situation, Matt is allergic to animals and the two girls do their utmost best to hide Chestnut from their adoptive parents as he eventually grows into a large dog. 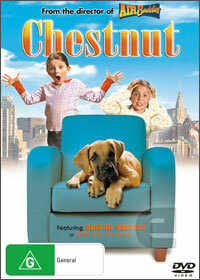 Although clichéd at times, especially the predictable ending, Chestnut is definitely a great family movie that can be watched by everyone and features some great memorable moments such as the cleaner stuck on a ceiling fan or Chestnut being smuggled out of the building in a pony suit. It's fun, it's camp and best of all Chestnut is the perfect family comedy!